The breakdown of transformer oil is actually random and closely related to the transient state of the oil gap electric field. The non-uniformity of the impurity distribution in the transformer oil and the movement of the impurity particles cause the distribution of the impurity particles between the oil gaps to change with time, so the position of the bridge in the electric field is unpredictable. 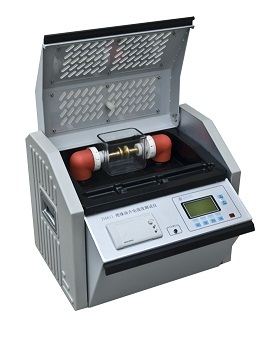 For the flat-plate chamfered electrode, the space occupied by the relatively uniform electric field is relatively large, the position of the small bridge formation is unpredictable, and the probability of formation is relatively large, resulting in a lower breakdown voltage during the test. appear. From the analysis of the above breakdown mechanism, we can know that the breakdown of the oil gap is a transient moment, but the process is complicated. Even if it is a sample of glass, the measured value in the multiple breakdown test will also be In the case of large dispersibility, the test standard specifies that the average of six tests is taken as the test result. Its purpose is to maintain the influence of these factors on the results at a constant level through artificially strict regulations, so as to obtain a relative Accurate test results. JY6611 transformer oil breakdown voltage tester has electromagnetic compatibility function, intelligent CPU control, to avoid the crash phenomenon during the test.